Of the 180 miles of shoreline, less than 40 are within jurisdiction of the State Recreation Area. No state or local agency has the financial resources to address the trash problem on the remaining 130 miles bordering public land. Volunteerism must fill this void. The Haw River Assembly has been conducting annual trash cleanups along the length of the Haw River for the last 29 years. Members of the Carolina Canoe Club also do cleanups at canoe access areas. Despite these efforts, the inaccessibility of much of the shoreline of the Haw River Arm of Jordan Lake has greatly limited trash removal since the lake was formed 35 years ago. But thanks to the hard work of thousands of volunteers for Clean Jordan Lake, the trash legacy has disappeared on 20 miles of the most heavily impacted shoreline. But keeping up with new trash still keeps volunteers very busy. Clean Jordan Lake sponsors semi-annual cleanups open to the general public. These are held in March and October. In addition, many groups come to the lake for community service days. They include youth organizations such as YMCA Guides, Scouts of America and YMCA Summer Camp; local high schools (Green Hope, Carrboro and Northwood); corporations such as Sensus, GSK, Duke Energy, Syngenta, Biogen Idec, BB&T, NC Blue Cross-Blue Shield, Dell and Dude Solutions; university organizations such as UNC Alpha Phi Omega service fraternity, UNC Pre-Pharmacy Club, UNC ROTC Cadets, NCSU Swim Club and the Elon Sierra Club; and civic groups such as NC Geocachers, Sierra Club affiliates, and Rotary Clubs. And we also have Adopt-a-Shoreline and Adopt-a-Feed-Stream Programs to keep designated areas clean throughout the year. 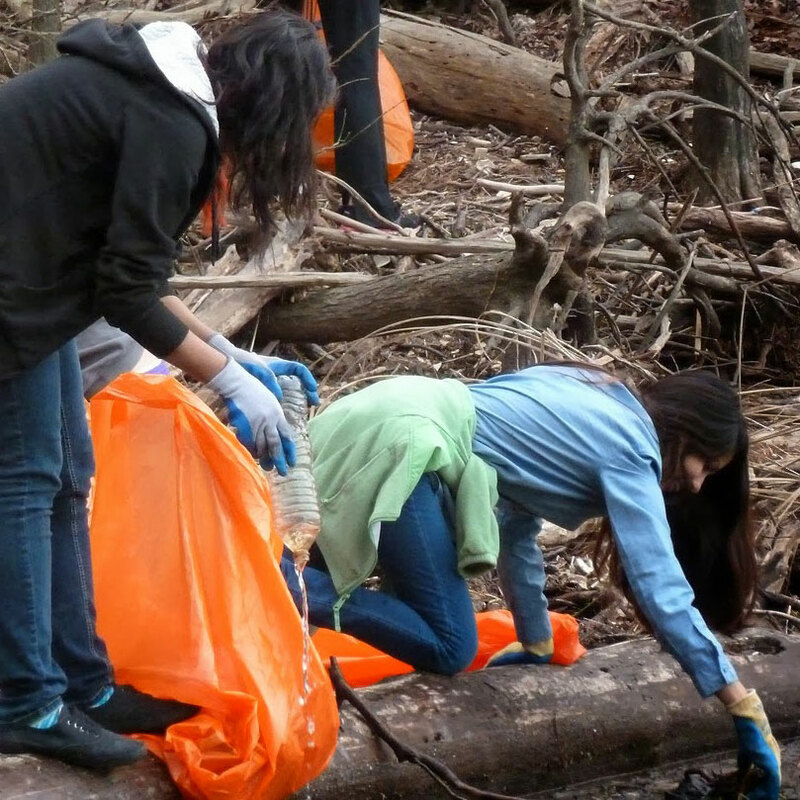 Thousands of volunteers have participated in several hundred cleanup events so far. In addition to trash, over 4,600 tires, many still on rims, have been removed. View our accomplishments each year by clicking here. Our early success is vividly portrayed in NBC17 News coverage of the October 2010 cleanup event in conjunction with NC Big Sweep that attracted about 200 volunteers. Picking up trash is hard work but can also be a lot of fun as this video shows! We are moving toward public education on trash prevention. A grant from the BoatU.S. Foundation to Clean Jordan Lake produced signage and brochures to attract more from the boating community to our cause. Clean Jordan Lake achieves its mission without paid staff. We are indebted to local and state agencies, organizations and private business for their support. We have a cooperative agreement with the U.S. Army Corps of Engineers (USACE) that provides for boats to ferry volunteers and trash as well other logistical support. The Chatham County Solid Waste & Recycling Division provides roll-off dumpsters and waives the landfill tipping fee. The Bridgestone Americas Tires4ward Program has enabled free pickup and recycling of tires. The NC Wildlife Resources Commission has cleared paths for volunteers to reach trash sites. The NC Dept. of Transportation, Highway Stormwater Program has donated thousands of bags. The Piedmont Section of the U.S. Coast Guard Auxiliary has given on-water logistical support. Cross Winds Boating Center and Jordan Lake Water Sports have provided pontoon boats and operators to ferry volunteers and trash. As of June 2018, the value of volunteer hours and goods and services that have been donated exceeds $850,000.